An Rebolusyon Pranses (1789-1799) amo an panahon han samok politikal ngan sosyal ngan tigda nga pagbag-o ha kaagi han Fransya, nga an pangobyernohan nga monarkiya nga may peudal nga pribilehiyo han mga aristokratiko ngan kapadian Katoliko, nagtigda pagbago tungod han mga Nalamragan nga prinsipyo han pagiging bongtohanon o citizenship ngan mga katungod nga diri nababawi. Cole, Alistair; Peter Campbell (1989). French electoral systems and elections since 1789. Gower. http://books.google.com/?id=msOIAAAAMAAJ&q=%22first+bicameral+legislature%22+directory+french&dq=%22first+bicameral+legislature%22+directory+french. Doyle, William (1990). The Oxford history of the French Revolution (3rd ed.). Oxford: Oxford University Press. ISBN 0-19-285221-3. http://books.google.com/?id=N7chHQAACAAJ&dq=Oxford+history+of+the+French+Revolution. Doyle, William (2001). The French Revolution: A very short introduction. Oxford: Oxford University Press. ISBN 0-19-285396-1. http://books.google.com/?id=B-Zf4topzfQC&dq=0192853961. Doyle, William (2002). The Oxford history of the French Revolution (2nd ed.). Oxford University Press. ISBN 0-19-925298-X. http://books.google.com/?id=oMYWKlevAV4C. Frey, Linda; Marsha Frey (2004). The French Revolution. Westport, Connecticut: Greenwood Press. ISBN 0-313-32193-0. http://books.google.com/?id=RFgXl1EG5soC&dq=Short+History+of+the+French+Revolution+Doyle. Furet, François (1995). Revolutionary France, 1770–1880. Blackwell Publishing. ISBN 0-631-19808-3. http://books.google.com/?id=EPsEJIdFz3AC&dq=Revolutionary+France+Furet. Hanson, Paul (2009). Contesting the French Revolution. Blackwell Publishing. ISBN 978-1-4051-6083-4. http://books.google.com/?id=dsCf8Q0xqO4C&pg=PA186&dq=legacy+french+revolution&cd=17#v=onepage&q=legacy%20french%20revolution. Hibbert, Christopher (1980). The Days of the French Revolution. New York: Quill, William Morrow. ISBN 0-688-03704-6. http://books.google.com/?id=yr1z38HCkdAC&dq=Hibbert+French+Revolution. Lefebvre, Georges (1971). The French Revolution: From Its Origins to 1793. Columbia University Press. ISBN 0-231-08598-2. http://books.google.com/?id=I2oA5MtB0ZkC&dq=Lefebvre+estates+general. Neely, Sylvia (2008). A Concise History of the French Revolution. Rowman & Littlefield. ISBN 0-7425-3411-1. http://books.google.com/?id=fccjTyOQiYwC&dq=The+Estates-General. Rude, George (1991). The French Revolution: Its Causes, Its History and Its Legacy After 200 Years. Grove Press. ISBN 0-8021-3272-3. http://books.google.com/?id=f1pMIbvzKckC&dq=causes+of+the+French+Revolution. Schama, Simon (2004) . Citizens. Penguin. ISBN 0-14-101727-9. Soboul, Albert (1977). A short history of the French Revolution: 1789–1799. Geoffrey Symcox. University of California Press, Ltd. ISBN 0-520-03419-8. http://books.google.com/?id=GSdw2oC60cwC&dq=Soboul+French+Revolution. Woronoff, Denis (1984). The Thermidorean regime and the directory: 1794-1799. Cambridge: Cambridge University Press. ISBN 0-521-28917-3. Azurmendi, Joxe (1997). The democrats and the violent. Mirande's critique of the French Revolution. Philosophical viewpoint. (Original: Demokratak eta biolentoak, Donostia: Elkar ISBN 84-7917-744-6). McPhee, Peter, ed. (2012). A Companion to the French Revolution. Wiley. ISBN 9781118316412. http://books.google.com/books?id=Hj9dY-JAzw0C&pg=PR15. Andress, David. The terror: Civil war in the French revolution (2006). Blanning, T.C.W. The French Revolutionary Wars 1787–1802 (1996). Rothenberg, Gunther E. (Spring 1988). "The Origins, Causes, and Extension of the Wars of the French Revolution and Napoleon". Journal of Interdisciplinary History 18 (4): 771–793. JSTOR 204824. Tackett, Timothy, "The French Revolution and religion to 1794," and Suzanne Desan, "The French Revolution and religion, 1795-1815," in Stewart J. Brown and Timothy Tackett, eds. The Cambridge History of Christianity vol. 7 (Cambridge UP, 2006). Desan, Suzanne. "What's after Political Culture? Recent French Revolutionary Historiography," French Historical Studies (2000) 23#1 pp 163–196. Furet, François. Interpreting the French revolution (1981). Hanson, Paul R. Contesting the French Revolution (2009). 248 pp. Reichardt, Rolf: The French Revolution as a European Media Event, European History Online, Mainz: Institute of European History, 2010, retrieved: December 17, 2012. Burke, Edmund (1790). Reflections on the Revolution in France. 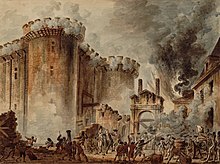 https://en.wikipedia.org/wiki/Reflections_on_the_Revolution_in_France. Ini nga pakli kataposan nga ginliwat dida han 02:46, 12 Enero 2015.